¡Olé! Flamenco explores the history and practice of Flamenco, an art form that incorporates dance and music. In his latest BookTalk, author/photographer George Ancona talks about his process of creating photoessays and his love for flamenco. What made you decide to write a book about flamenco? I’ve been interested in flamenco for a long time. When I was younger I played guitar beginning with classical and later switching to flamenco. When I became a photographer I left the guitar behind. There was no time to practice since I began to travel on assignments. 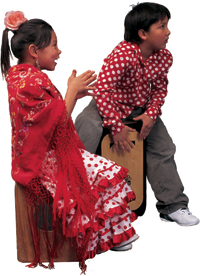 Do you dance, play, or sing flamenco? Not anymore, but I never hesitate to get up to dance, whatever the music. Why do you find flamenco so interesting? Flamenco encourages the expression of individual emotions and feelings. What research did you do? Did you get to travel anywhere special? My fascination with flamenco began when I went to Spain to do a story for Jubilee magazine about the work of the young priests and nuns in the small villages and slums of Malaga, Spain. When I visited a school, the teacher asked two girls to get up and dance for me. I was very touched. Then I went to the south of France to see the Gypsy gathering to celebrate their black Madonna, Sara-la-Kali. And they danced in the streets. But that was long before I had begun to do children’s books. What were some facts or stories that didn’t make it into the book? Flamenco, as a living art, has absorbed musical influences from many parts of the world, including Spain, Cuba, Peru, and Argentina, and it continues to create new forms. In the book, you mention that historically, a blacksmith might use his hammer and anvil like an instrument, to keep time with his song. Did you learn any other ways in which flamenco artists would incorporate their daily lives into their art? The songs of flamenco singers touch on many subjects in their lives: their families, culture, sadness, joy, love, fear, pain, and laughter. They are very dramatic because their heritage is one of persecution. You often play the role of both author and photographer for your books, as you did with ¡Olé! Flamenco. Which do you usually work on first, the manuscript or the photographs? Every book I have written began with images. I meet people and when I explain that I’m doing a children’s book most people are very cooperative and invite me into their lives. Then I begin to take pictures. Slowly the images take on a story form and I begin to look for the beginning, middle, and end of the story. Finally I sit down to write at home in my studio with the images spread out in the sequence I see for the story. How did you meet Janira and how did you decide to make her the focus of this book? 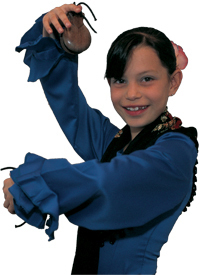 Janira was the youngest dancer of the dance group, Flamenco’s Next Generation. She fit the audience for the book, which is ages 7 to 11. Are there any challenges to photographing dancers? Since flamenco is such an intuitive art form you have to be ready for anything the dancer will do. So you shoot a lot of film and throw out many pictures. You have to trust your intuition. What were some of the other challenges to making this book? Since there are no written records of the history of the Roma (Gypsy) people, there exist only assumptions, which often differ. Spellings, names, accents, and other details would vary among the people I spoke to or read about. Another one of your books is Capoeira, which is also about a kind of dance. Which do you think you’d be better at, capoeira or flamenco? In capoeira the participant "dances" with a partner and tries to defeat him or her. This is done with leaps and somersaults. That’s not for me. 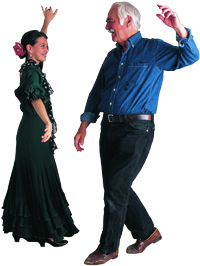 Nor is dancing alone, as is done in flamenco. I’d rather get up and dance with a partner—like in a Sevillana or a tango.